Over the years, Jazz has had many heroes, but few have done as much for it as Norman Granz who, ironically, never contributed an actual note to the music. Alex Barris offers this brief chronicle of some of the achievements of one of the great patrons of Jazz. The photograph of Mr. Granz is by William P. Gottlieb and is in the Library of Congress/Gershwin Fund. “Jazz lover are, by and large, a jaded lot. You need only mention a few words like ‘producer’ or ‘promoter’ and your jaded jazz fan will react as though you had used a dirty word. Of course, sometimes they are right. But not always. 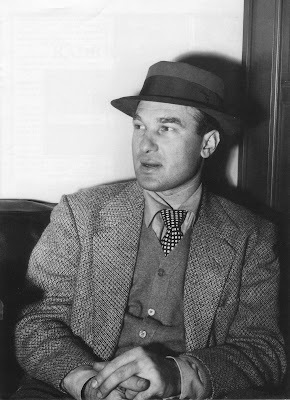 For example, I maintain – and have for some time – that jazz has had no greater friend, certainly among non-musicians, than Norman Granz. Yes, I know about John Hammond, George Wein, Leonard Feather, George Simon, Ira Gitler and Whitney Balliett. I’ll still put Granz ahead of them. Okay, some reasons. 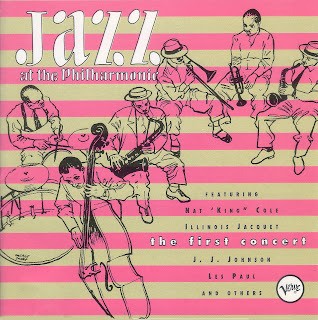 First of all there was Jazz at the Philharmonic [JATP], which, starting in 1943, presented a long-running series of concert tours, attracting countless thousands of young people to the wonders of jazz. True, some of them tended to get noisy, stomped and applauded and cheered and behaved like – well, exuberant kids. (So Had Sinatra fans before that, and Presley, Beatle and Michael Jackson fans since). 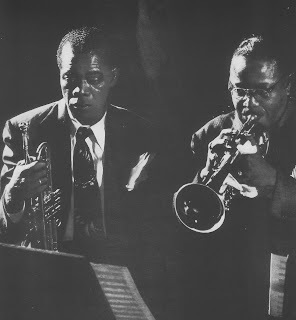 But JATP fans got to hear the giants of jazz like Lester Young and Roy Eldridge, Dizzy Gillespie and Charlie Parker, Bud Powell and Willie Smith. 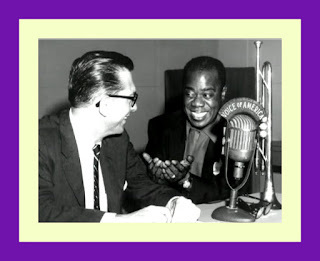 And it was at a JATP concert in New York that people outside of Canada were introduced to Oscar Peterson. In the 1940s and 1950s, racially segregated audiences were still the norm. Not with Granz. He insisted, and got it written into contracts, that in travel arrangements and in accommodations for his musicians, there must be no segregation. And he did not hesitate to cancel dates if these conditions were not met. More, he insisted that the same rules apply to buying tickets and seating arrangements. Which explained why JATP simply did not play in the U.S. south. Granz stuck to his principles. 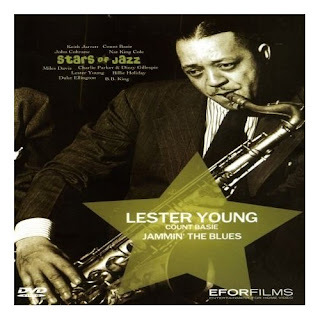 Then, in 1944, there was Jammin’ the Blues, the first and arguably still the best movie short made that dealt with jazz, presenting Lester Young, Harry Edison, Barney Kessel, Illinois, Jacquet, John Simmons, Red Callender and Sidney Catlett in a jam session atmosphere that was revolutionary for a Hollywood studio (Warner Brothers, in this case, who did not care a hang about jazz but wanted to give the wizard photographer Gjon Mili a shot at directing and allowed Granz to function as producer of the 10-minue film). 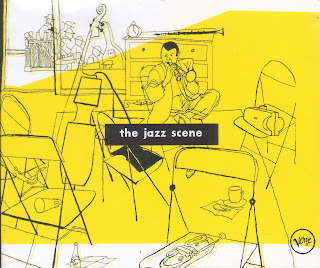 Credit Granz also for introducing millions of jazz fans to the brilliant work of graphic artist David Stone Martin (No, Granz did not discover him, nor did he claim to). Martin had done some album covers for Asch records in 1944. But it was when Granz began to record his JATP albums with Asch that record buyers became aware of Martin’s remarkable work. And when Granz left Asch to form Clef he persuaded David Stone Martin to join Clef. 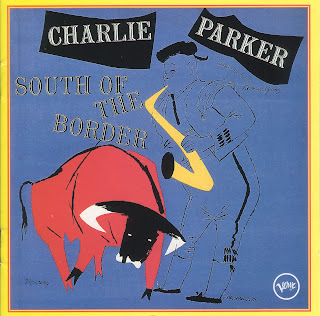 Indeed Martin’s splendid line drawing of a trumpeter (for which Charlie Shavers was the unwitting model) became Granz’s logo on Clef and later on Verve album covers. Over a period of two decades, Martin was to produce more than 200 album covers for Granz, most of them startlingly imaginative. Of course, JATP was only one aspect of Granz’s producing-recording career. 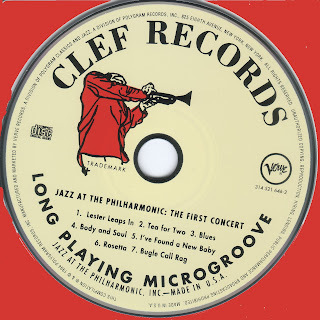 There was also once-in-a-lifetime projects such as The Jazz Scene a magnificent package recorded in 1949 (on six 12-inch 78 rpm discs) that presented, in various combinations, such diverse artists as Duke Ellington, Neal Hefti, Coleman Hawkins, Charlie Parker, Buddy Rich and Bud Powell. This was issued (on Mercury) in a limited and numbered edition. Only 5,000 copies were made (mine is number 4396). It was later reissued on LP, but it’s hard to find. 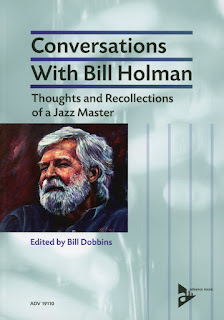 [A CD version is still available at: http://www.amazon.com/Jazz-Scene-Various-Artists/dp/B0000046TH/ref=sr_1_1?ie=UTF8&s=music&qid=1211735841&sr=1-1]. 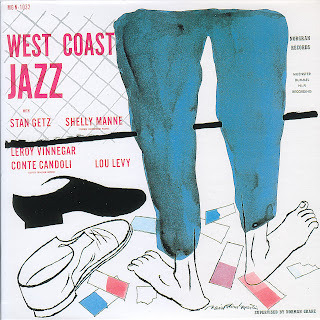 My own favorite on this album is the combination Lester Young, Buddy Rich and Auy Guy (code name of Nat King Cole, who was under contract to Capitol) playing I Want To Be Happy. The package also had some marvelous photos by Mili [see below for photo of Louis Armstrong and Roy Eldridge] and some equally exquisite drawings by Martin [see above for cover art]. 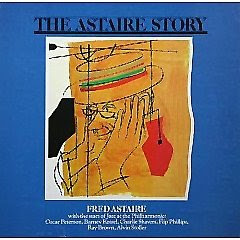 And then, just a few years after that, there was The Astaire Story, in which the famed dancer introduced and sang some of his movie hits, backed by such stellar jazzmen as Oscar Peterson, Charlie Savers, Barney Kessel, Flip Phillips and Ray Brown. Once again, Martin supplied a memorable sketch of Astaire for the cover. Most of all, however, I think Granz deserves a lot of credit for his dedication to jazz and to the musicians who played it. One important manifestation of that dedication was during the dark decade starting in the mid-50s, when the explosion of rock ‘n roll all but wiped out the market for many jazz artists. Zoot Sims, Joe Pass, Harry “Sweets” Edison, Teddy Wilson, Bud Powell, Charlie Parker, Hank Jones and Stan Getz. Granz also initiated the Ella Fitzgerald “songbook” albums and made no less that 27 albums with Art Tatum, and later fought to regain control of them (he had sold Verve to MGM) so that he could reissue the Tatum albums. No doubt, the cynics will argue that Granz did all these things to make money. Perhaps. But even if that’s true (and I don’t think it is in every case) the fact that he did them was of immense help to the beleaguered jazz community. Even if you disagree with his choice of that particular musician, you can’t argue with his yardstick." 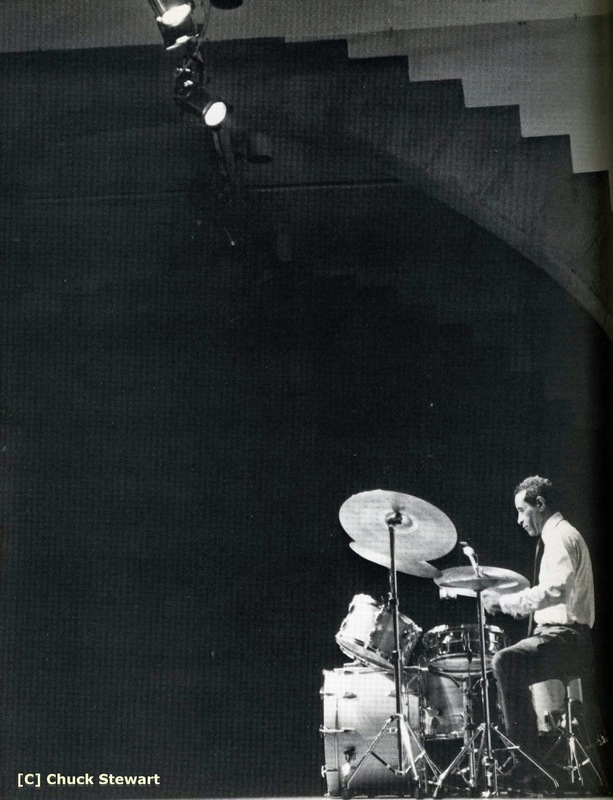 Shelly Manne - Jazz "Today"
The Jazzprofiles editorial staff is indebted to Mr. Jim Harrod of Jazz Research for this Ray Avery photograph of drummer Shelly Manne from the November 1956 edition of Jazz Today and the Add Manne and Vinnegar: Serve Piping Hot article by Jack Maher from the July 1957 edition of Jazz Today. 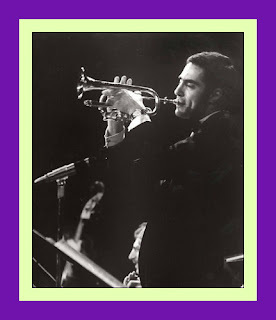 As you read the cover subject comments below, the reader may wish to keep in mind that by the mid-1950s, the Jazz world was still experiencing the [relatively “new”] transition from big bands to small groups. Indeed, the November 1956 edition of Jazz Today also contains a feature article entitled: A History of the Small Group in Jazz! 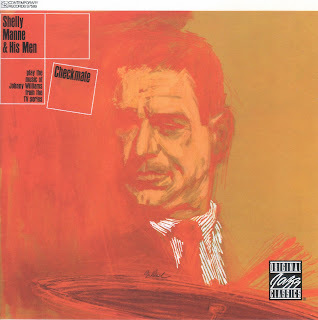 “Shelly Manne, our cover subject for this month, is about as much representative of the small group movement today as can be found. 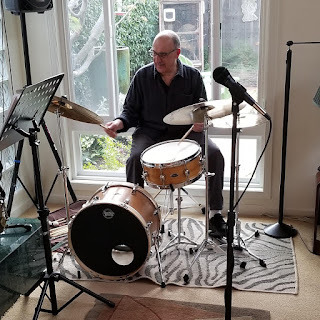 His recordings with the varied and sundry personnel of the Los Angeles area, and, with his own group reflects the strength and popularity of the three, four, five and six piece bands on both coasts. “Time, and the application of it, has taken another and more perfect turn through the recent performances of a rhythm duo operating on the far West Coast. Responsible for this new, invigorating concept of the drum and bass duo are Shelly Manne and Leroy Vinnegar. To be ultra-truthful, there’s nothing new about the Manne-Vinnegar team. What they have done is to solidify and expand the rhythm team all at once. The solidification comes from the feeling of unity that Shelly’s drumming and Leroy’s bass are able to produce. Shelly’s concept of drums is primarily four-four. He uses the high-hat as a point of emphasis most times in a very slight way. This gives his rhythmic line an evenness rather than a predominantly two-four feeling. 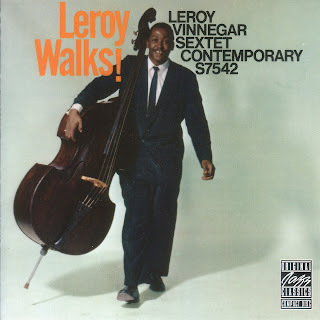 Leroy, in accordance with this, throbs his bass line, with that same four-four concept and with the added value of a big, round, sound making each note sound for its full value. The linear effect of the two instruments played separately is really as if they were one. The drums providing a sharp, critical percussion and the bass a wide, controlled full-sounding note value to each stroke of tempo. The expansion takes place in the individual ability of each of the musicians in himself. Leroy often plays through the notes that go to make a particular chord, instead of just sounding the same notes over and over again. He uses also, often in concert with Shelly and a pianist, a triple-plucking technique that presents an effective variant to the usually strong, straight quarter-note line. 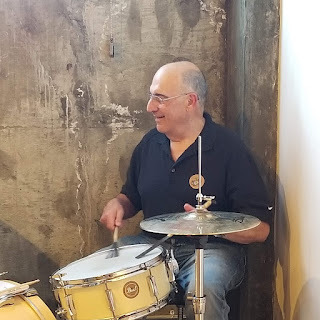 Shelly’s use of counter-rhythm figures, bass drum punctuation and counter-tempo variation in the high-hat broadens the usual repetitive playing of the drummer. His concept in figures behind a soloist often has all the variety and all the freshness of the distinctively individual and stimulating melodic ideas he has in his solos. Together these two individuals form a near perfect basis for any soloist: non-intrusive, fresh and inspiring, and, what’s of the utmost importance, a unified feeling and sound. A feeling and sound that has compactness, pressure and pulse. After writing the above impression of the Manne-Vinnegar team, we went by way of Bell long-distance telephone to the Northridge, California home of Shelly Manne for verification or, if necessary, disputation by Shelly himself. What follows are the impressions Shelly Had on the position and functions of the rhythm section. ‘What I like to hear, and strive for myself, in a rhythm section, is a section. I want to hear three men playing together as a section, the same as a brass section or a sax section with all the members playing together, not as sometimes happens an individual drum section, bass section and piano section. It’s all important that members of the rhythm section, and in fact the whole band, to be at one with one another. There’s a need for personal as well as musical regard for one another. It’s most important too, for the bass and drums to have the same sense of time, the same swing feeling, and mutual respect for one another’s abilities. 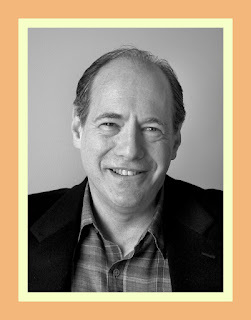 They must be open to hear what’s going on around them, and aware and flexible enough to fit with the whole band. Sometimes we play things along with the horns, at other times we play contrapuntal figures. In any case, the rhythm men have to be sensitive and equipped enough to respond to one another and to the other members of the band. As far as the importance of the rhythm section today is concerned, I think it’s just as important now as it ever was. The pulsation is the important thing. Even when you don’t have the constant pulsation, when you eliminate it, the swing, the pulsation itself must be there – implied if you like – for it to swing. I don’t seriously believe you can ever do away with the rhythm section altogether in jazz. For variety and development you can have the rhythm section stop playing for a chorus or two, we do, and the effect when they come pounding back in is twice as exciting. And about drummers in general: ‘You know, I think a lot of drummers are confusing funk with soul. Playing the high-hat, for instance, seems to be a lost art. I like the feeling of having a snap on two and four but not the heavy predominance that’s so much in evidence today: the heavy two-four accent is becoming a crutch. 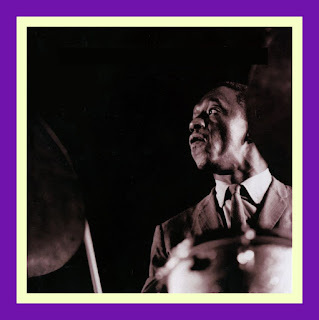 I think I need to spend more time with the high-hat – go back and listen to some of those old Basie records with Jo Jones – they have some wonderfully colorful effects. 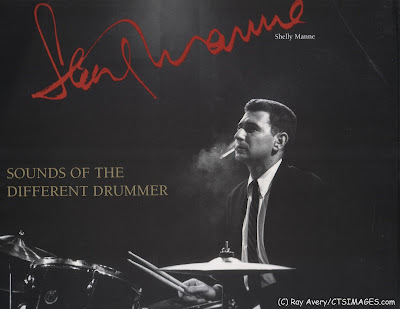 Should you like to know more about Shelly Manne, perhaps "... the most musical drummer who ever lived," Jack Brand and Bill Korst have put together a magnificent biography, discography and filmography of his career entitled Shelly Manne: Sounds of a Different Drummer copies of which can be obtained at http://www.percxpress.com/book.htm.